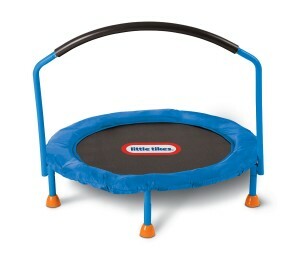 Little Tikes Trampolines - Trampoline for Me! Little Tikes is a company that specializes in children toy and furniture manufacturing. So it’s fair to say that everything they make is children-friendly, safe and fun for kids. These trampolines are no exception to that rule. When it comes to kids, this is truly a one-stop for most of your worries and their fun. This cute little thing is something you can lean on if you’re tight on budget as it is really cheap. It is a really reliable, portable and sturdy option for little kids. Yes, very little. This one has a weight limit of 55 pounds. That is a little low, but it makes it up in its price. Also, it is made out of unique webbing material which means there are no springs or bungee cords. This and the fact that you can jump the lowest on this one makes it the safest trampoline out of our 3 picks. It is really easy to assemble, the handle is really wide and the bouncing surface is the same as our #1 pick – 36″ in diameter. It is padded on the sides as well. And since this one is not designed for heavier kids in mind, you won’t have to worry about the back lifting off. My neighbors have this one and they simply love it. It is said that it is for indoor usage only, but it is safe to bring it outside. Click here to view Little Tikes on Amazon! 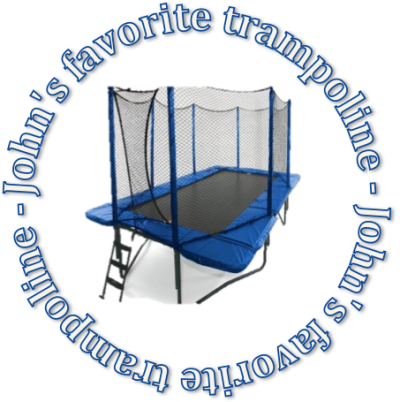 As the name implies, it is 7′ or 72″ in diameter, which is a really big surface to jump on for a kid. It is classified for 3-10 years old and it doesn’t have the definite weight limit, so you can relax on this one. My wife used to jump with one kid without any problem at all, although they never tried bringing in the other one – so I can’t speak from experience how much can it handle actually. A kid and mom for sure. 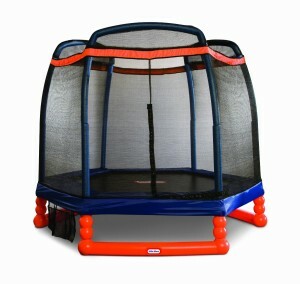 It does come with a little bigger price tag and it sounds right actually – this is a serious trampoline. There is a safety net up to the top so you don’t have to worry about your kid falling off! Also, legs are curvier so the base of support is sturdier and stronger which allows everybody to jump higher. This one operates on high-quality springs which are really greatly guarded by safety net and pads, so you won’t have to worry about pinching a lot. However, I do suggest you look at the trampoline after you assemble it and figure if there is a gap of any sort where the springs can be seen and fill it with some foam just to ensure you’re safe enough! Oh, and while we’re at assembling – it is really, really easy! The part that can be a little difficult are springs, but it just needs a little strength, nothing special. Because it is big, I suggest you use it outdoors. I mean, all my trampolines are outdoor and have ever been, but the smaller ones you can bring inside if that is your preference. So, to sum it up, this is a great choice, little more expensive but it is a big and great source of fun for your children and you if you wish so. Click here to view Little Tikes 7′ on Amazon!